A shelter-in-place was ordered at Western Connecticut State University on Tuesday after someone reported seeing a man with a gun on campus. 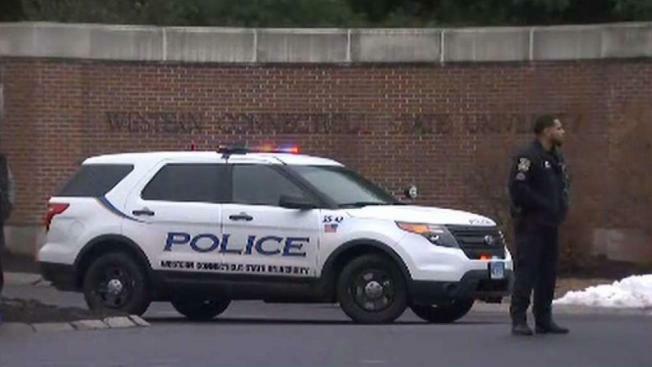 Authorities have ended a shelter-in-place issued on the Westside campus at Western Connecticut State University in Danbury after an unsubstantiated report of a person with a gun in the Visual and Performing Arts building. School officials said a woman called 911 around 2 p.m. and reported seeing a man with a rifle inside the Visual and Performing Arts building. State police, Danbury Police, WestConn police and SWAT all responded and went room-by-room in the building. The building was evacuated and the rest of campus was placed under a shelter-in-place order until police complete the search. The shelter-in-place order lasted several hours. The all-clear was called around 5 p.m.
School officials said no shots were fired, no one was injured and they did not find anyone with a weapon. Students who spoke with NBC Connecticut said the situation was stressful and all they could do was wait for an update. "It was kinda crazy, we got a text message or an alert from West Conn that said there was an active shooter in the building right next to ours so immediately our class informed our teacher and shut off the lights. They were stacking tables in front of the door, we didn’t really know what to expect," said Senior Brianna Velky. Danbury Mayor Mark Boughton said three public schools near the school were placed on lockdown then underwent supervised release. While the campus has been declared safe, police continue to investigate the report.